One of the most pure and deeply inspirational relationships is that of a devoted teacher and willing students. Almost everyone has a favorite and those we liked less, it totally depends on how the student teacher relationship were developed, nurtured and given space to evolve. According to Whitaker (2005), the main variable in the classroom is not the student, but the teacher. Great teachers have high expectations for their students, but even higher expectations for themselves. These teachers recognize the importance of connecting with their students, that if they are unable to connect with them emotionally then influencing their minds may be impossible. “Good teachers put snags in the river of children passing by, and over time, they redirect hundreds of lives… There is an innocence that conspires to hold humanity together …” (Bolman & Deal, 2005, p. 124). “A fundamental question for a student is ‘Does my teacher like me?’ Given a rigorous, aligned curriculum, the answer to that simple question is our best predictor of student achievement” (Terry, 2008). Teacher knowledge and efficacy of student motivation and achievement are crucial components to creating relationships that motivate. Both teachers and students have to value their contribution. A student has to feel worthwhile and appreciated. A teacher needs to recognize that he or she can have a positive effect on their students. Wise man and Hunt (2005) refer to this as “teacher efficacy” and note that the more the teacher believes in this, the more they will cause it to happen. Students are influenced by perceptions of their teacher’s even handedness, competence, caring and support as well as the nature of the teacher-student relationship that results (Stipek, 2005). A student wants to feel connected to people and to feel as though he or she deserves to be loved and respected (Stipek, 2005). According to Stipek many of the students who are not doing well academically, are the same ones who have a poor relationship with their teachers. Typically, the more they fall behind academically, often, the more this relationship is weakened. If they are constantly remains back in class, the environment and the teacher-student relationship (STR) begin to hold negative associations. Students who perceived a more nurturing relationship with their teachers tended to have better attitudes towards academics and often did better than their peers who lacked the same support system. Some other researches supported the idea that a good teacher-student relationship positively influenced learning. The more connected a child feels, the more they are willing to attempt tasks and to seek help when necessary. The student who feels this sense of connectedness may want to maintain it or please the teacher by doing well in class. Positive teacher expectations were associated with high academic performance or academic gains, whereas negative teacher expectations resulted in decrease in academic performance. The significance of knowing teacher’s beliefs regarding their roles in student motivation is crucial due to the accepted correlation between this perception and actions. “The quality of teacher–student relationships is the keystone for all other aspects of classroom management” (Marzano & Marzano, 2008,). Reinforcement theorists argue that motivation is in the environment, not in the person such as the teacher (Stipek, 2005). However, it is the teacher who plays the greatest role in setting the atmosphere (Whitaker, 2005). Whitaker (2005) argues that it is better to create the relationship that will motivate the student to behave well. School climate and culture will enable or restrict classroom instruction and student learning (Stewart, 2008), since students adapt to their environment. If educators create a culture where students are expected to succeed, many often conform. Researchers van der Westhuizen, Mosoge, Swanepoel, and Coetsee, (2005) suggest that an effective organizational culture can enhance academic achievement and lead to reduced student drop out and failure rates, effective discipline, and regular attendance. Stewart (2008) identifies three facets of school climate these are school culture, school organizational structure and the school social structure. The school’s culture influences student’s connectedness to their environment which research suggests affects academic achievement. The second element is school organizational structure, which Stewart uses to describe school and class size, both found to lead to positive behavioral and scholastic achievement. The third element Stewart explored was the schools social structure, which includes characteristics such as staff and student ethnicity, gender, socioeconomic status, teacher skill and preparation. Motivational theorist suggests that student’s perception of their relationship with their teacher is essential in motivating students to perform well. (Fan & Williams, 2010).Students with high self-esteem are more likely to be self-efficacious and set higher goals .Self-esteem also effects student socially. (Orth, Robin &Widaman, 2012). Students with the high self-esteem are more likely to have positive relationship with peers as well as adults. (Orth et al,2012). Theoretical framework related to STR is explained with the help of attachment theory given by John Bowlby and Mary Ainsworth. According to Bowlby and Ainsworth “The ability for an individual to form an emotional attachment to another person gives a sense of stability and security necessary to take risk, branch out and grow to develop a personality. Effect of teacher’s attachment style in the formation and maintenance of classroom and staffroom relationship and the degree of influence these factors have on teacher’s classroom behavior, particularly management of student behavior. The more the attachment of a teacher will be with their student the better will be the student teacher relationship. Similarly, the more will student achieve academically. 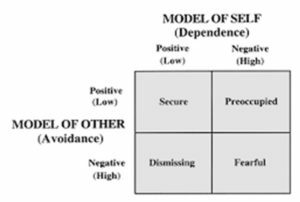 This model suggest that if an individual (students) have positive interaction with others say as teachers they will have secure relationship. If other person (teacher) have positive but student have negative interaction then relationship will be preoccupied. Similarly if negative interaction will be from teacher’s side and positive from student’s side relationship will be dismissing. Most severe of this is when negative interaction is from both sides than relationship will be fearful. In such a situation the student will not be able to achieve more in their academic life. In this section, the literature pertaining to the student-teacher relationships and variables that appear to contribute to the development or deterioration of the student-teacher relationship will be reviewed, including student behavior, teacher behavior, and the interaction between students and teachers. The review begins with framework for understanding student teacher relationships, and how it can be applied to develop better student-teacher relationships. Finally evidence concerning the stability of student-teacher relationships over time will be presented and discussed. One study examines the ways in which teacher qualifications and other school inputs are related to student achievement across states. The findings of both the qualitative and quantitative analyses suggest that the investments in the quality of teachers may be related to improvements in student performance. Quantitative analyses indicate that measures of teacher preparation and certification are by far the strongest correlates of student achievement in reading and learning, both before and after controlling for student poverty and language status. State policy surveys and case study data are used to evaluate policies that influence the overall level of teacher qualifications within and across states. This analysis suggests that policies adopted by states regarding teacher education, licensing, hiring, and professional development may make an important difference in the qualifications and capacities that teachers bring to their work. Another article reviews the extant research on the relationship between students and teachers in higher education across three main areas the quality of this relationship, its consequences and its antecedents. In this article, the focus was on the higher education or university context, and on one particularly significant relationship within that setting the student teacher relationship (STR). The significance of the interpersonal relationship between students and teachers for students’ successful school adjustment has been widely recognized in research addressing kindergarten, primary and secondary education. (Bernstein-Yamashiro, B., & Noam. G. G., 2013). The overall aim of this paper was to provide an overview of research relating to STR in higher education. STR has emerged as an important construct in educational research within school and pre-school settings, but remains largely neglected in higher-education research. This review has shown that STR should be regarded as a relevant construct in higher education as well as it clearly affects students’ successful study progress, including factors such as course satisfaction, retention, learning approaches and achievement. It has also revealed that the empirical basis is less clear and comprehensive in terms of the consequences of STR for university teachers. However, it is likely that STR also affects university teachers, for example through their adoption of particular teaching practices, which in turn affects teaching quality. It was conclude that STR should be regarded as a relevant research agenda for higher education. (Hangenaver & Volet, 2014). A healthy and strong STR promotes and plays a significant role in improving the student’s academic achievement as well as motivation. Moreover, the psychological well being of the student is closely related to the STR that further has an impact on the character and personality building of the student. This study will provide us to investigate the importance of STR on grades or academic achievement of students. So, we as a student will be able to apply these findings on our own relationships with teacher in order to get success academically. The aim of this research is to find out the influence of STR on the academic achievement of University students and to know that how students perform because of healthy or unhealthy relationship among them and their teachers. How does the STR have an effect on student’s academic achievement? There is likely to be a relationship between STR and academic performance of University students. This Descriptive study is designed to depict the participants in an accurate way. More simply put, descriptive research is all about describing people who take part in the study. (Devin Kowalczyk, 2015). This study is designed to measure the STR and its influence on student academic achievement. The sample was comprises of teacher and students of Punjab University who are teaching and studying here respectively for at least 2 years. The sample of (N=70 students) & (N=30 teacher) were selected by using Quota sampling depending on the condition for the collection of data from male and female students from different institute of Punjab University including Applied Psychology, English department and Agriculture department. Teachers who are teaching in a department for at least 2 years are included because only the older teachers have well developed relationship with their students. Teachers who are willing to participate in this study are included. Students who are studying in a department for at least 2 years are included because only the older students have well developed relationship with their teacher are included. Willing students are included because only willing participants will give effective responses. Teachers who are new at some department are excluded because they have not well developed relation with their students as they are new. Unwilling teachers are excluded because they will not respond effectively. New comers are excluded as they haven’t developed any relation with teachers. Students who are not willing are excluded. Demographic questionnaire was prepared by the researcher in English to measure the demographic factors. The Questionnaire inquired characteristics of mother of students and teachers. Demographic information regarding mother was consist of student’s age, family system, monthly family income, background information of previous schooling. Gender and the characteristics of teacher. Guidance was taken from Kamran.F and she further improved that Questionnaire. Questionnaire for student about teacher evaluation was used to assess the perceived attitude towards their teacher. This Questionnaire was developed by Abdulrehman,K. (2007). These Questionnaire measure different aspects of students perceived attitude toward their teachers. Respondent answered on 4 point scale that point out how much the statement apply to the student teacher relationship. The rating scale was followed as strongly agree=4, agree=3, disagree=2 & strongly disagree to=1 and is a type of likert scale. The data was collected from the University students and teachers of Applied Psychology department, English department and agriculture department after taking permission from participant. Sample was comprises of 70 students and 30 teachers from these three department. The following assessment measure was used; Demographic information Questionnaire and Questionnaire for measuring Student attitude towards teachers. Before the application of questionnaire the participant was given the information for explaining the nature and purpose of study. The rights of participant were also being explained. On the basis of their willingness sample was selected. Necessary instructions were given regarding filling the questionnaire. After taking consent, participant completed the questionnaire which assessed their demographic and attitude of students toward their specific teacher. Different procedures were used for the participant who couldn’t fill the questionnaire their selves. Questions were read by the researcher and participant were encouraged to ask researcher to repeat statement if did not understand. The researcher and the participant were sited next to each other in convenient manner. Participant could see and read the items easily. The statistical package for social sciences (SPSS) version 20 was used to analyze data. The analytical strategy used for data analysis involving descriptive analysis to examine mean, percentage, and frequencies of demographic, clinical and psychological variables. Associations were find out between demographic and STR by using Pearson product moment correlation analyses. Results were reported and discussed afterward. Ethical guideline by American Psychological Association (APA) was followed by conducting research involving human being. Code of conduct involve following ethical consideration. Permission was sort from concerned authorities of administration of three selected departments for data collections. Participants were given the information regarding the nature and purpose of study. Consent was taken from participants who showed their willingness to participate in the research. Participants were informed about their right to withdraw at any time from research with no penalty. Confidentiality of the data was also ensuring to participant. Participants were assured that their identity will not be disclosed to anyone and identity no will be used instead of name. Participants were assured that their contact number will be remain in database using protection. It is required in any case if further information or data is needed. At the end of this project, it will be removed from database if they are still not satisfied, they may leave unfilled. Hill.C.H, Rowan.B & Loewenberg.B. 2009, Effect of teacher’s Knowledge for teaching on student achievement. American Educational Research Journal, 42(2), pp 371-406. Hangenauer.G & Volet.S. 2012, Teacher Student relationship: an important yet under research field. Oxford review of education journal, 2(2), pp 370-388. Jasmi.A.N, & Hin.L.C. 2014, Student Teacher relationship and student’s academic motivation. Journal of inter disciplinary Research in education, 4(2), pp 75-82. Hammond.L.D. 2007, Teacher quality and student achievement; A review of state policy evidence. A peer reviewed scholarly electronic journal, 8(1), pp 1068-2341. Harris.D.N & Sass.T.R. 2009, Teacher training, teacher quality and student achievement. Journal of Public Economics, 95(2), pp 798-812. Lessard.A., Poirier.M & Fortin,L.2010, Student Teacher Relationship: A protective factor against school dropout? Procedia Social and Behavioural Science, Vol 2, pp 1636-1643. Lee.J.S. 2012, The effect of student teacher relationship and academic press on student engagement and academic performance. International Journal of Educational Research,53(1), pp 330-340. Yunas,M.M., Osman,W.S. & Ishak,N.M. 2011, Teacher Student Relationship effecting motivation and academic achievement in classroom. Procedia Social and /behavioural Sciences, 15(2), pp 2637-2641. Hughes.J. & Kuwok.O.M. 2012, Influence of Student Teacher and Parent Teacher on lower achieving readers engagement and achievement in the primary grades. PubMed Central Journal, 99(1), pp 39-51.